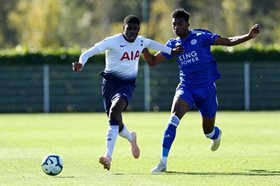 Tottenham Hotspur boss Mauricio Pochettino is aware of the qualities of the dual eligible English-Nigerian starlet Timothy Eyoma, having named him in the squad for the tour of United States for pre-season training. According to Football.London's Spurs correspondent, Alasdair Gold, Mauricio Pochettino and Ryan Mason scouted Tottenham Hotspur's 1-0 win against Leicester City in a Premier League 2 fixture at Hotspur Way on Friday afternoon. Eyoma would have been keen to impress the Argentinian football tactician and he did at the end of ninety minutes, having made sure goalkeeper Brandon Austin did not concede though he was yellow carded 57 minutes into the game. The game was deadlocked until the 87th minute when Jack Roles bagged the winner, converting from six yards after exchanging passes with Kazaiah Sterling. In his seventh PL2 appearance of the season, Eyoma operated as a right-sided central defender in a three-man defense. The 18-year-old went the distance as England U19s thrashed Macedonia 6-2 in an international friendly at St George's Park three days ago. Nigerian left back Calvin Ughelumba joined the fray in the 34th minute, replacing the injured Uche Rubio.